Nearly every day we hear from our customers, or from people they know, talking about us. We really like this because it is usually them saying how wonderful their carers are and how much it means to be looked after and supported by the Bellcare team. We have a well-earned reputation for providing exceptionally high levels of care for our customers and for providing great working conditions, opportunities for career development and excellent rates of pay for our employees. That's why Bellcare are making the difference in personal care in Cumbria and make the difference for personal carers. Could you care for someone else? If so, we'd love to hear from you. As a fast-growing organisation, we currently employ over 160 members of staff and our team is ever-expanding. 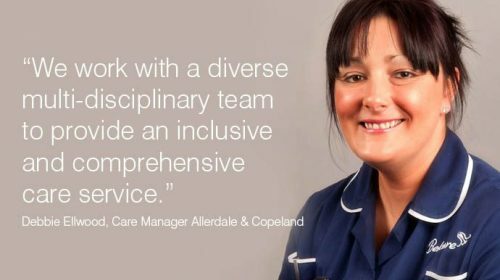 Care assistants, team leaders, administration and support staff - we are regularly looking out for talented, hard working individuals to join us. Based either from the head office in Workington or from our Penrith offices, our people provide care services for elderly, disabled and disadvantaged people across the North and West of Cumbria. If you would be interested in joining us, take a look at the Current Vacancies we have and get in touch using our online application. You can also Download a copy of our Job Application Form.